Nothing more could go wrong for maverick hostage negotiator Mulvaney Quinn. First stabbed in the hand during a failed terrorist burst, then arrested for a hate crime he didn't commit. Now Quinn must come face to face with his past in order to stop the worst terrorist threat of all time--a plot to bring about the ultimate religious uprising by destroying one of the most sacred relics in history. $lt;br>But the $lt;i>Fuse of Armageddon$lt;/i> has already been lit. With the clock ticking down toward a global catastrophe, Quinn must team up with the most unlikely ally of all--the woman who arrested him--to bring down an even more unlikely coalition of enemies. Facing an unholy trinity of a Jewish fanatic, a Muslim terrorist, and a "Christian" freedom fighter, only Quinn can stop them from achieving their goal. But will he be in time? Or is it already too late? Because when Armageddon is unleashed, the fate of the entire world hangs in the balance. Sigmund Brouwer is the award-winning author of scores of books, from youth fiction to adult thrillers. His books has been lauded in publications such as Library Journal and Booklist and he has received the Alberta Film and Literary Arts Writing Grant twice. He speaks at schools, home-schooling conventions, writing camps and seminars to provide encouragement to reluctant readers and writers and to encourage youth to follow their dreams of a career in writing. He co-founded The Young Writer's Institute with education expert Debra Bell. Brouwer teaches writing courses at Red Deer College. Brouwer, his wife and daughter divide their time between Tennessee and Alberta.- Publisher. Customer Reviews For "Fuse of Armageddon"
Fast Paced, Political, End Times Thriller! This is the first novel I have read by Hanegraaff but not the first by Brouwer. This is a very effective marriage, having these two authors together. 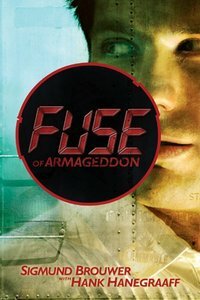 Fuse of Armageddon is a "...can't wait to see what happens next..." type book. It has a pace fast enough to not be too slow while authors set the background plots but not too fast that you would miss these details. There are a few sections where the authors "preach" about the history of the Israel/Palestinian conflict and while this "preaching" is criticised by reader and publishers alike in other novels, I found it necessary to be this way for the sake of plot development and is central to such. While the authors may not have intentionally set out to include humour, I found the habit of the main character, Quinn, repeatedly saying, "... Rule one in negotiating:......". There are so many aspects to Rule one that you could list them as an Appendix of Hostage Negotiation!! There is never a Rule Two!! I found this not distracting but a buffer to the seriousness of the dialogue surrounding the hostage negotiation of Quin, Safady, and other characters. There is a few subplots that come together nicely in the last few chapters of the novel and it is good to see how they all fit into each other. As these are developing, they add many twists and turns to the main plot. I liked that. The authors have obviously done their research too.